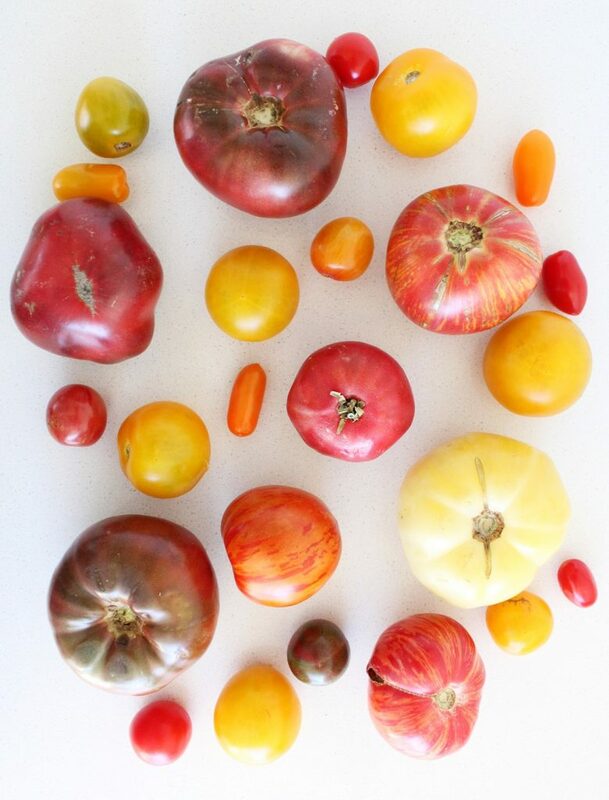 I get antsy during tomato season if I don’t have a satisfactory number of local tomatoes in my house at all times. It’s a short season and the alternative during the rest of the year is so sad in comparison that I feel tremendous pressure to make the very most of one of my favourite food seasons (and yet I feel close to no pressure for so many seemingly more important things…). So, short of the Spanish Tomatina Festival, tomatoes have been on, in, under and around everything that has been happening in the kitchen these days. Usually just salad like the Avocado Caprese or this one from last summer with avo croutons, but as you saw last week, there has also been pasta. This week got really hot and I thought we could keep things simple. Tomato smoothie? Tomato is fruit after all. 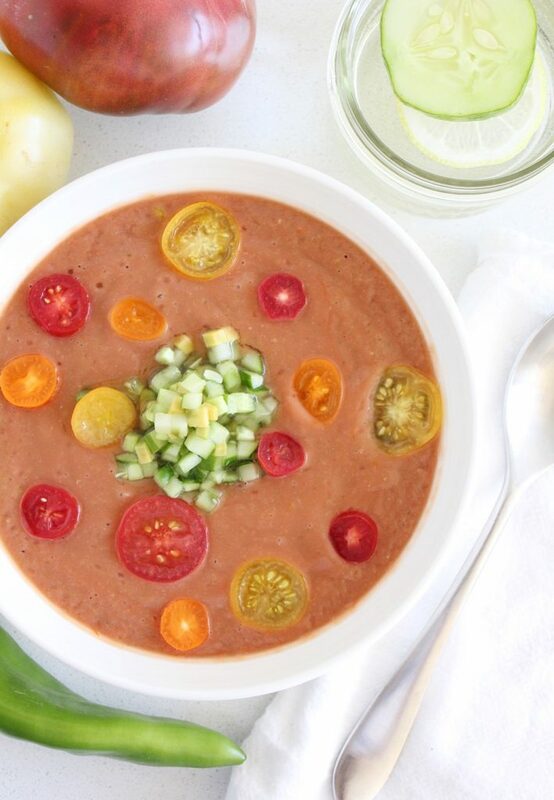 So we made gazpacho, a much more appealing name for a delicious, savory tomato smoothie. I posted an Instagram ‘Story’ last week, demo-ing the process, but it is literally a chop everything up and throw it in the blender situation. You don’t even need a high-power blender, all of the ingredients are pretty soft and easy to blend. 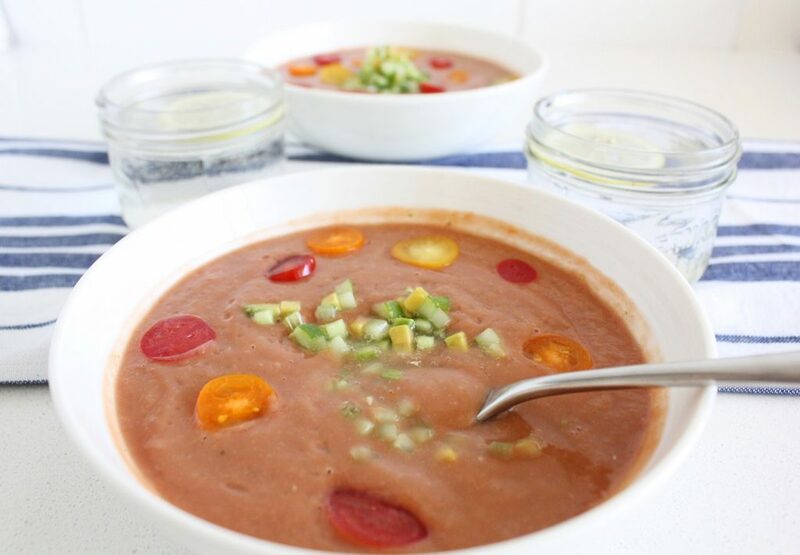 There are many versions of gazpacho out there, some include bread to thicken it and make it smooth, lots use sherry vinegar to spike it up in a sweet, more complex way, and some use cooked tomatoes or tomato juice to deepen the tomato flavour. Our version is totally raw and for that reason it tastes incredibly fresh. We use lemon juice as the acidity balance because we love the taste and the tomatoes were sweet and perfect and needed only a tiny nudge. Then we considered some type of cooked legume to thicken it like the bread would (it works this way too, and adds some protein) but wanted to keep it ‘hot summer afternoon patio’ light and fresh tasting, so we settled on avocado. 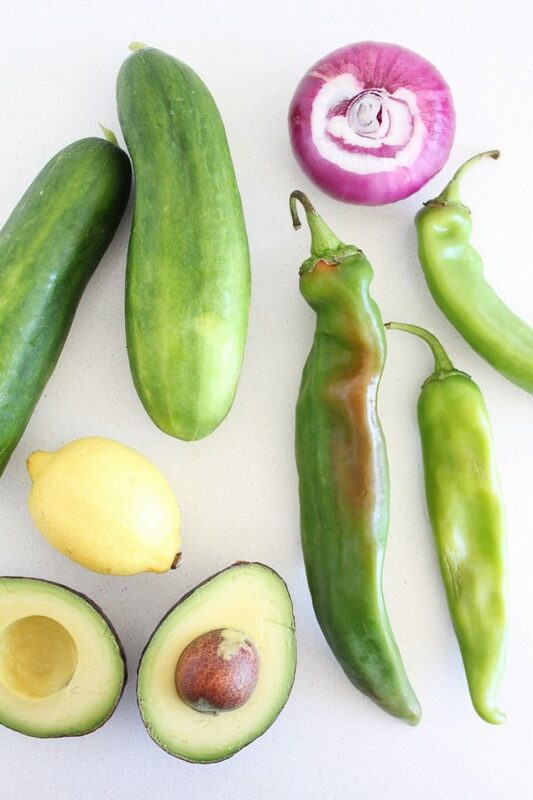 The avo adds healthy fats, which make the nutrients from the rest of the ingredients more absorbable. It also gives it richness and binds it together in a way that makes you feel less like you’re eating puréed salad and more like you’re eating garden velvet. I just made that up, but it sounds pretty good, right? Since this recipe is so simple, it’s very important that you taste every ingredient that you’re going to use before you put it in the blender. 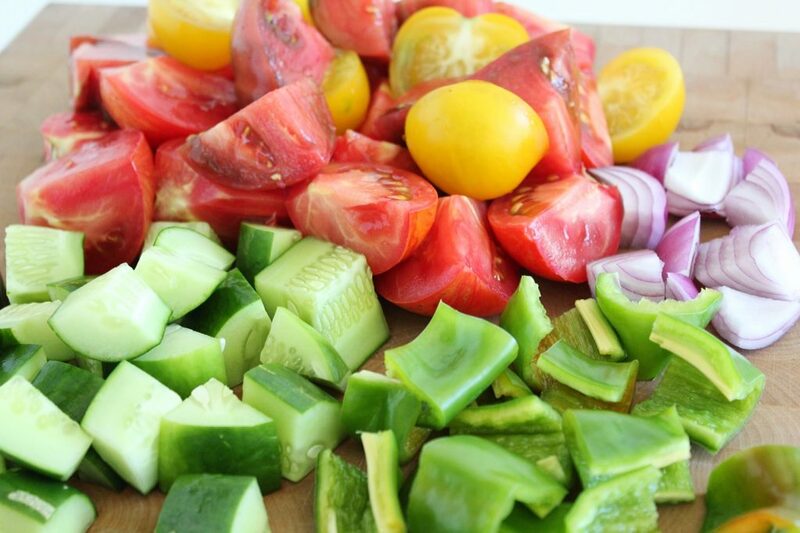 Make sure the tomatoes are at their best, and that the cucumber is not too bitter (they taste good on they’re own this way, but not when it becomes the overpowering taste of the soup). Then there are the peppers! These anaheims were chosen because we wanted the soup to have some mild kick. Peppers can be very unpredictable though, and these suckers were HOT, especially for anaheims (that’s why we taste first!). I probably wouldn’t have served it to your average, innocent gazpacho fan, but I loved the extra kick, and Wes, as I’ve mentioned before, is only comfortable when some part of him is on fire, so he was thrilled. 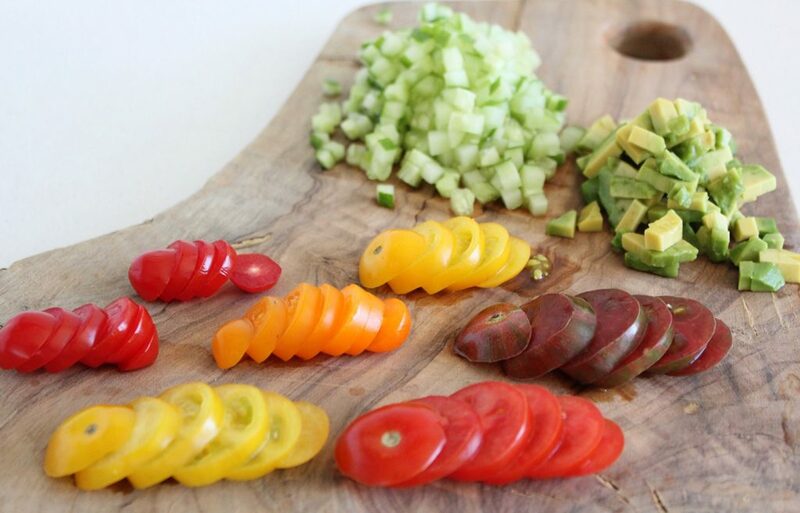 If you want a guarantee of no spice, use a bell pepper (red/yellow/orange). You can freeze any extra gazpacho, and can actually make them into popsicles (weird, but trust me, when you’re hungry and so hot, a savory popsicle can be exactly what you didn’t even know you wanted). You can also cook it, if warm foods are working better for you these days. Just put it in a pot and simmer for 5-10 minutes. It takes on a more mellow but rich taste, brings out more lycopene in the tomatoes, and maintains all of the summer vibes. 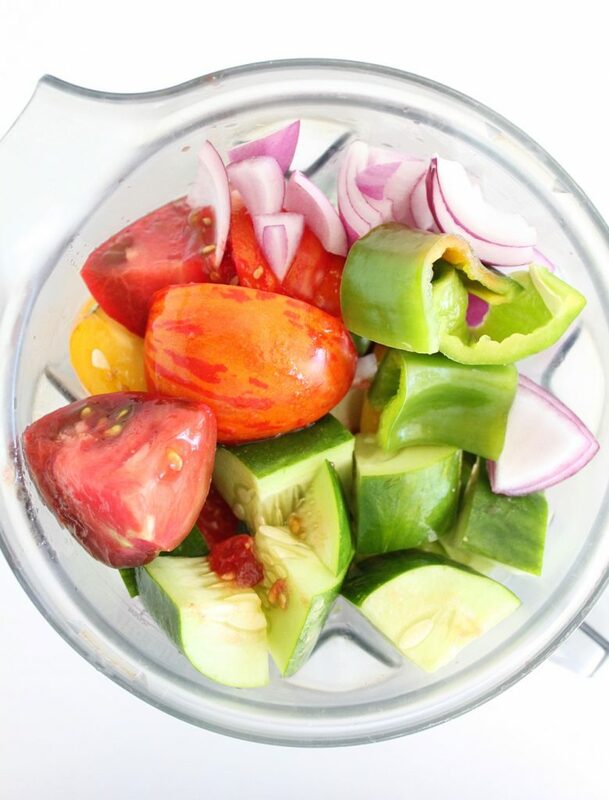 Gazpacho tastes the most complex after day one, so make it a day ahead (or do what I did and make it, have it for lunch, dinner and then the next day too). 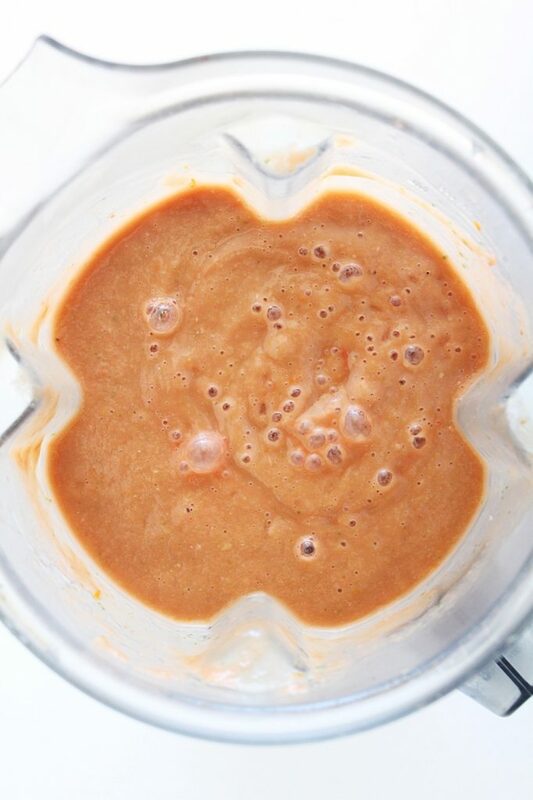 Roughly chop ingredients and blend together in a blender until very smooth. Refrigerate overnight (or pour it into a bowl and put that bowl into a bowl of ice -it tastes better cold. 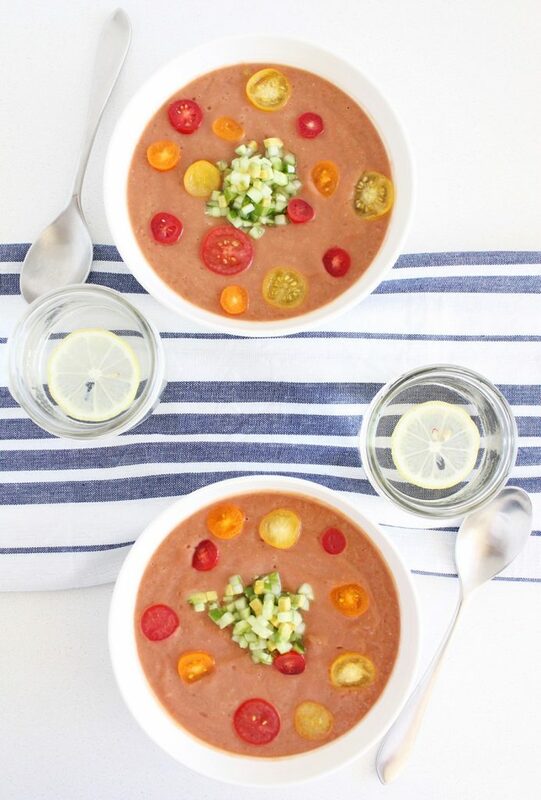 Pour into bowls and garnish with fresh cherry tomatoes and/or diced cucumber. It keeps for up to 3-5 days.